“The CCC was a godsend for the reservation,” Lucille observed. Enrollees received training as communication radio operators, mechanics, and heavy equipment operators—skills they later used to find employment with telephone companies, on construction crews, on highway projects, and in industrial manufacturing. Lucille donated much of her monthly salary to support her brothers’ college education in Missoula. That left next to nothing for her to live on, yet she remained self-supporting throughout the Depression, taking additional work as a records clerk and voter registrar at the BIA office on the reservation. Lucille’s first husband, Phillip Rouiller, died in 1955, leaving her to raise their daughter, Renee, alone in an era of high unemployment on the reservation. Recalling how beneficial the Indian CCC had been for Indian people, Lucille, as a member of the Democratic Central Committee of Lake County, suggested to Montana Senator Lee Metcalf the creation of a reservation-based vocational training program similar to the Indian CCC. Metcalf responded with legislation that created the Kicking Horse Jobs Corps in Ronan in 1966. Lucille’s greatest achievement, however, was empowering tribal members to vote. She was only eight years old when the Indian Citizenship Act of 1924 made all members of federally recognized tribes American citizens, ostensibly enfranchising them. Her mother set a precedent by being the first Indian woman on the reservation to register to vote. Adeline Trosper then became the first female juror in Lake County. It wasn’t until her mother’s death in 1960 that the importance of these “firsts” fully dawned on Lucille. “I got to thinking how pitiful the Indians were in not voting,” she said. Heavily outnumbered by non-Indians, even on the reservation, the few Indians who did vote couldn’t influence elections, and elected officials seldom concerned themselves with Indian issues or the impact of legislation on Indian people. Part of the problem stemmed from efforts by the state to curtail the Indian vote. A 1932 amendment to Montana’s constitution permitted only tax-paying individuals to vote, thereby disenfranchising Indians who lived on, or derived income from, trust lands. Five years later, Montana prohibited individuals who did not pay local taxes from becoming local registrars, effectively suppressing Indian voter registration in reservation counties. By the time the Voting Rights Act passed in 1965 to remove these barriers, many tribal members had given up on trying to vote. Lucille Roullier set out to change this situation. 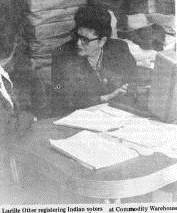 In one week in 1974, Lucille Otter registered 200 Indian voters at the St. Ignatius Commodity Center. Her ultimate goal was to create “Indian voting block” that could swing elections. Char-Koosta News, October 1, 1974, p. 5. Her strategy at first was to register Indian women. “I really concentrated on the women, the mothers, because I thought they would encourage their children to vote. I went all over the reservation, to every residence.” She took time to teach each new voter how to fill out a ballot correctly so that their votes would count. Many tribal elders, whose rights had been ignored so long by the government, wouldn’t vote even after she had registered them. Lucille persisted. “The Indians are going to be left in the dust if you don’t get a hold of what’s going on in our government,” she told those who wavered. When women complained that their husbands didn’t want them at the polls, she showed them how to apply for absentee ballots. 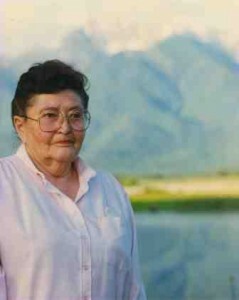 Occasionally, Lucille, who remarried in 1969 to Laurence Otter, faced significant opposition to her efforts from some of the white residents on the Flathead Reservation, but that only motivated her to work harder. She set up registration tables at the commodity distribution warehouse, at local events, and in grocery stores. She carried extra registration cards in her car, and once, while out fishing, even registered a young woman on horseback. Interested in learning more? Other Indian women active in politics include Fort Peck’s Dolly Cusker Akers, the first Native American to serve in the Montana legislator. Read more here. Knox, Margaret L. “The New Indian Wars: A Growing National Movement Is Gunning for Tribal Treaties, Reservations and Rights.” Los Angeles Times, November 7, 1993. Accessed October 21, 2013. Laskowski, Jeannine, Jackie Drews, and Cynthia Kingston. “Women Making It Happen: Lucille Otter.” InterMountain Woman, October/November 1996, 40-43. Lucille T. Otter interview, June 24, 1995. Small Collection 1623, Montana Historical Society Archives, Helena. “Lucille Otter Laid to Rest.” Char-Koosta News, June 20, 1997, 1. “Lucille Otter Rounding Up Tribal Votes.” Char-Koosta News, October 1, 1974, 5, 14. Montana Human Rights Network. Drumming Up Resentment: The Anti-Indian Movement in Montana. N.p., January 2000, 4. Otter, Lucille. “Circle June 6th on Your Calendar.” Char-Koosta News. June 1, 1978, 1.
me believe it was important that I did!